In 2005, the New Oxford American Dictionary defined "podcast" as its word of the year. But it's taken almost a decade for podcasts to finally gain momentum. And that's good news for you if you're an expert, because a podcast is the ideal way to share your expertise. Briefly, a podcast is an audio newsletter. It's like an e-mail newsletter, except that instead of getting articles downloaded automatically into your in-box, you get audio programs downloaded automatically to your phone, tablet or computer. You choose what podcasts you subscribe to, and that's all you get. I held high hopes for podcasting years ago, but nothing much happened. One of the reasons was the growth of online video, which leapfrogged audio as the multimedia medium of choice for many people. Podcasting didn't die, but it wasn't growing either. Now podcasting is making a comeback - partly because of the success of the drama Serial in the USA, which propelled online audio back into the spotlight. According to Edison Research, almost half of America listened to a podcast in the last month, compared with about 20% in 2006. Podcasting offers many benefits for us in business as well. Audio is more personal than text. I love writing, but I know many people don't. It can be difficult to get your ideas out of your head and into writing. Sure, you can hire somebody else to do the writing for you, but it can still feel like a struggle. Unless you do a lot of writing, it's not easy to connect with people in writing, and even more difficult to create a personal connection that feels like you're there in the same room speaking to them. Audio solves this problem because they hear your voice. They know it's you (not some writer you hired), you speak in a conversational voice, and you don't have to follow all the rules of spelling and grammar. And yes, it can feel like you're there in the same room speaking to them. Audio is faster than video. It's faster to create, faster to edit, faster to produce, faster to download, and faster to consume (try playing a podcast at double-speed and you'll still be able to understand it). Most importantly, you can consume it while doing other things, like walking, driving, and exercising. It's far more difficult to multi-task when watching video, so you have to dedicate time to it (which often means it doesn't happen at all). For example, I like TED.com presentations, but I rarely make time for watching the videos. Fortunately, TED now publishes an audio podcast, which means I can listen to them while multi-tasking. Some of the presentations are too visual for audio (so I can watch them later if I'm really interested), but most of them aren't. 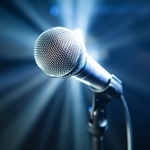 Add podcasting to your content marketing mix. As I said, I love writing (and reading), and many people love online video. So you shouldn't drop these altogether in favour of podcasting. I'm suggesting you add podcasting to your mix. If you haven't yet subscribed to podcasts, do so. Subscribe to a few, listen to a few episodes of a few podcasts and get a feel for how podcasting works. You'll see the diversity of topics, a range of sound quality and recording quality, the mix of content and advertising, and so on. Don't just be a listener, though - be a podcast publisher, and create a more personal connection with your clients, customers and network.